Pros: Astounding acrobatics and a novel immersive technique that forces the spectators to get to know each other. Cons: Some aspects, such as getting the audience to sing together, don’t work so well. 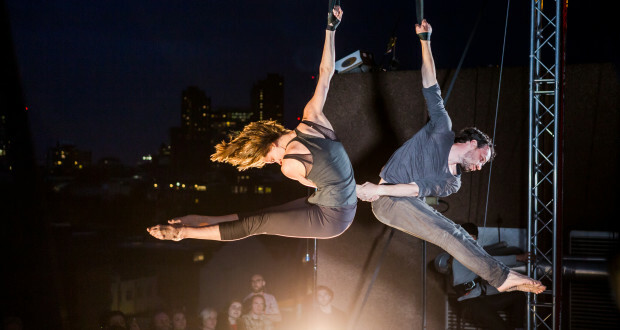 Circumference have created a top-notch immersive show with some jaw-dropping acrobatics. Living in such close proximity with so many strangers, we Londoners learn to avoid any social interaction with people we don’t know. We prefer to bury ourselves in our smartphones. This is exactly the reflex that Circumference try to smash apart in their show, Shelter Me. 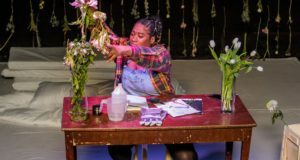 This immersive piece is set inside Theatre Delicatessen, a repurposed office block in Farringdon. Oh, and did I mention that they mix in some absolutely jaw-dropping acrobatics? Be warned, this performance requires audience participation. But even if you would normally avoid a show which requires you to do anything but sit back in your chair, you must go to this production. Indeed, you are the target audience. Circumference force us cold Londoners to realise that the strangers also attending the production are people too. To achieve this, they have a novel system: as you enter the venue, you are instructed to keep your phone ON at all times. The company collects your phone number and randomly assign you a buddy in the audience; your job throughout the performance is to message them, and eventually find them as you ambulate through the immersive show. No excuses: Don’t want to share your contact details? They’ll lend you a phone. Don’t have any battery? There is a phone-charging station. Can’t handle the social awkwardness? Everyone gets a free drink voucher. After the initial routine, the audience is led into a new space where small groups are sectioned off. All of the immersive elements are designed to break boundaries between the audience. My favourite example was when 20 people were crammed into a tiny kitchen and instructed to collaboratively make a single cup of coffee in under four minutes. It is amazing how quickly you get to know people when you are frantically looking for sugar in a confined space. All the while, the company prompts you via text message to try to find your partner: can you guess who they are? Are they watching the same acrobatics display as you right now? The beauty of the system is that once you do find your buddy, you feel like you have found an old friend. For the finale, everyone is led to the rooftop, providing a stunning view of London as the sun sets. 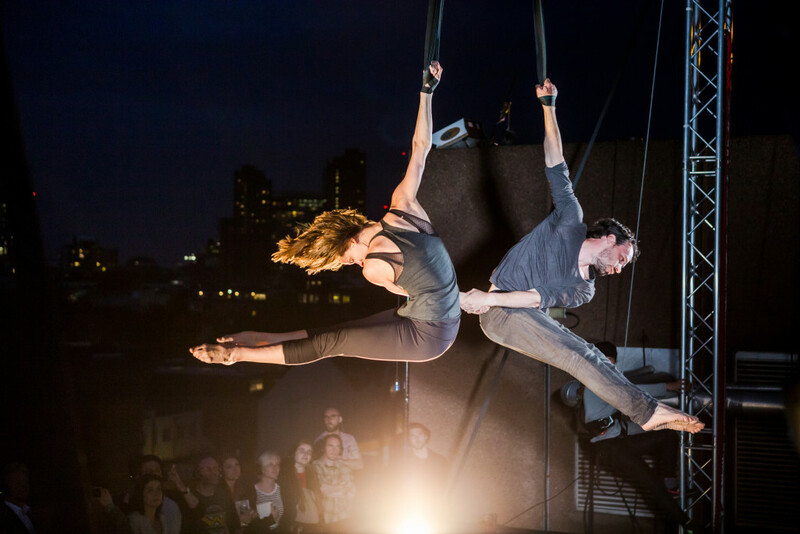 The final acrobatics display is on this rooftop, with the performers being raised a further few meters into the air by hanging straps. 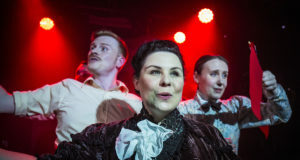 Their performance is elegant, brave and at times death-defying (one performer swings over the abyss while holding on to the strap with just one hand), and by the time the show finishes, you certainly have a lot to discuss with your buddy over another drink. Shelter Me is a novel piece, which will appeal to fans of Punchdrunk’s The Drowned Man. It also provides something extra: rather than being masked and silent, you are very much yourself. The performances themselves, in this case acrobatics, are of the highest quality too. Overall, Circumference really demonstrate that the people around us are people too, and that the smartphones which we usually hide away in can be a vehicle for new encounters. Louie is the co-founder and joint managing editor of Everything Theatre. He met James at university, and this event definitively changed his life for the worst. These days he a Ph.D. student in particle physics working on the Higgs boson's decay to two photons (seriously). He claims that theatre is his only release from an existence of signal-to-background ratios, selection efficiency and C++ programming. His particular preference is for well-executed site-specific productions and anything by Tom Stoppard. He has been widely misquoted as saying he "hates musicals". This is not true. He simply has not yet come across a musical he hasn't disliked.